Here is a list of Best Free Sprite Sheet Maker Software For Windows. In simple words, a sprite sheet is an image file made up of a collection of multiple images. Sprite sheets have many applications, like animation, website development, etc. In animation, sprite sheets help in lowering the memory consumption issue to a great extent and also boosts the game performance. Hence, these free sprite sheet maker are very helpful for the game developers. On the other hand, if I talk about the website development, sprite sheets make websites to load faster. Sprite sheets have several more applications than that of the two listed above. Download these free sprite sheet creator software, create sprite sheets, and use them in your project. All of these free sprite sheet generator software are simple to use. You can create sprite sheet simply by importing the images into the software. Most of these software do not mention the supported image formats to import. Hence, I tried many formats and these software supported most of the commonly used image formats, such as png, jpg, bmp, gif, etc. Some software to create sprite sheet come with animation feature. You can preview the created sprite sheet in Animate Mode by varying its frame per second rate. I will go with Cyotek Spriter to create sprite sheet. It supports a good number of image formats to import, like ICO, JIF, JPG, PNG, BMP, etc. You will get good customization options here. You can arrange the images in a sprite sheet in across and down directions. Moreover, you can also vary the padding in a sprite sheet. You may also like some best free Game Recording, Game Booster, and Gaming Voice Chat software for Windows. Cyotek Spriter is a free sprite sheet maker software for Windows. It lets you add multiple images to a single sprite sheet, but the maximum limit for importing images is not specified. It supports almost all popular image formats to import. Some of these image formats are ICO, JIF, JPG, PNG, BMP, PCX, PPM, TGA, TIFF, WBMP, JP2, GIF, etc. If you enable Image Numbers feature, it displays a number on each imported image. This lets you arrange the imported images easily as per your convenience. You can arrange the layout of sprite sheet in Across and Down directions as per your choice. The background of the sprite sheet remains transparent, the color of which can be changed. In addition to this, you can also vary the size of the sprite sheet. Padding: Padding is generally used to set the boundary of the image in a sprite sheet. Using padding, you can leave empty spaces at the boundaries as per your convenience. Packing Method: Fast, Simple, and Complex are the three packing methods provided in the software. As you change one packing method to another, the layout of the output sprite sheet also gets changed. After creating a sprite sheet, you can save/export it in different image formats, as discussed above. 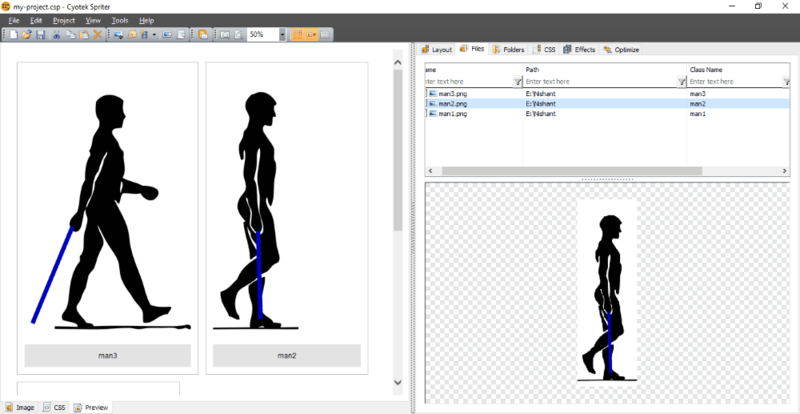 iSprite is a very simple sprite sheet maker software for Windows. Using this software, you can create a sprite sheet with a maximum of 100 rows and 100 columns. Moreover, the size of inserting an image to the rows and columns is also limited. An image with width and height greater than 100 pixels can’t be inserted into the rows and columns. An Auto Size option is provided on the interface. This option will resize the image automatically according to the size of the box. Hence, the image fits in the box perfectly. If I talk about the image formats supported by the software, it is not mentioned. I tried png, jpg, bmp, and tiff image formats to import into the software and it worked well for these formats. 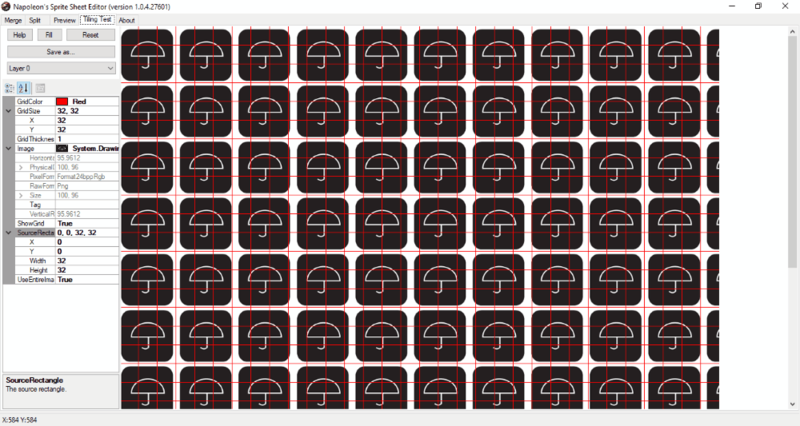 iSprite is a portable sprite sheet generator software. Napoleon’s Sprite Sheet Editor is one more free sprite sheet maker software for Windows. It lets you create sprite sheets by merging different images. You can import images of multiple formats into this freeware including png, jpg, bmp, gif, etc. However, these supported image formats are not mentioned in the software, but I tried aforementioned image formats to create sprite sheet. You can also vary the frame size of sprite sheet even after adding images to it. When you have created a sprite sheet successfully, you can save it in png, bmp, and jpeg image formats. The Preview tab of Napolean’s Sprite Sheet Editor lets you preview your created sprite sheet by animating it at a defined FPS. Besides this, you can also animate the images in a particular folder without creating its sprite sheet. Import Images: Clicking on this button will import the selected images into the software. Add All Images: This will create a sprite sheet by adding all the imported images to it. After creating a sprite sheet, you can export it in different image formats. The supported image formats are not mentioned in the software, but I tried png, jpg, tiff, and bmp image formats to export (also to import) the created sprite sheet and get the final output. Talking about the size of images to be inserted into a sprite sheet, this is also not mentioned in the software. But, I tried to import 500 x 500 sized image and it worked well for that. The limitation that I found in this software is you can create a sprite sheet with a maximum 10 columns at a time. Sprite Sheet Generator is another free and portable software to generate sprite sheet. As it works on a three-step process (open, preview, and generate), you will not find it difficult to understand. Here, you have to add the entire folder, the images of which you want to add to a sprite sheet. As you select the folder, it detects all the images it contains and arranges them in X rows and Y columns. You can change this order of images as per your interest. I am not sure about the supported image formats to be imported into the software. I tried it PNG, JPG, TIFF, and BMP formats and it supported these formats. When you are done, simply click on Generate button to create sprite sheet. The final sprite sheet is generated in png format. It is better to preview the created sprite sheet before generating it. The preview mode is available in four different sizes (0.25x, 0.5x, 1x, 2x). 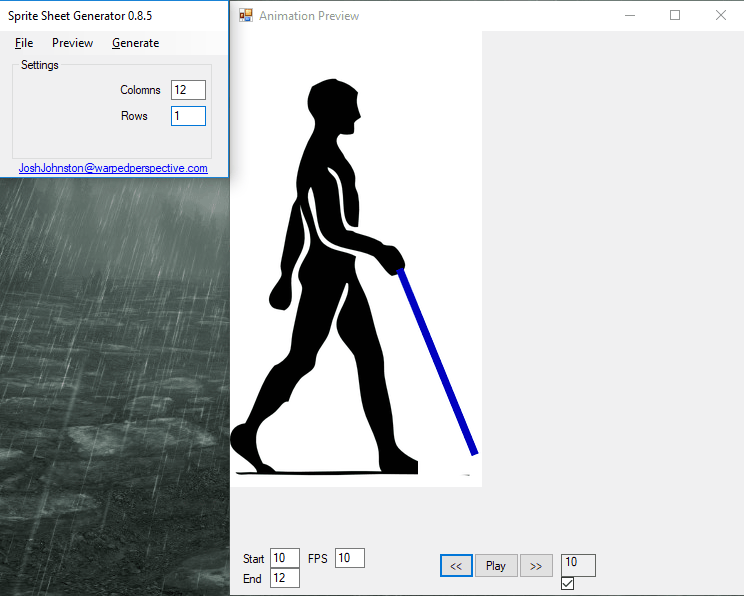 Animation Preview is an additional feature of this free sprite sheet maker software. This feature lets you animate your created sprite sheet at a particular frame per second rate. This lets you understand the behavior of your created sprite sheet in the game. While animating a sprite sheet, you can select the start and end frame among imported images and also vary the FPS from 0 to 99.